There's no stopping these 10 red-hot wrestlers. You can just tell when a WWE Superstar is hitting their stride and firing on all cylinders. Criteria can include (but not be limited to) their matches almost always delivering, you looking forward to their promos, their characters showing signs of developing, and most importantly, the audience being behind them (regardless of whether they're a face or a heel). In theory, that should describe every active member of the roster, but only a select few can truly say they're at the top of their game at the moment. After all, it doesn't take a ton for WWE to ruin any given star's momentum or hold them back from reaching their potential through bad booking and mind-boggling decisions. The ones they get it right with, however, shine the brightest as their hottest acts, and that is certainly the case these days with these 10 performers. If it weren't for the following superstars, who knows how much worse off Raw and SmackDown Live would be. Although Bray Wyatt was a logical first feud for "Woken" Matt Hardy coming into 2018, they didn't gel as well in the ring together as many had hoped, at least as opponents. None of their three matches on Raw and at Elimination Chamber were exactly exciting, though Ultimate Deletion turned out to be exactly what both men needed to resurrect their fledgling careers and characters. 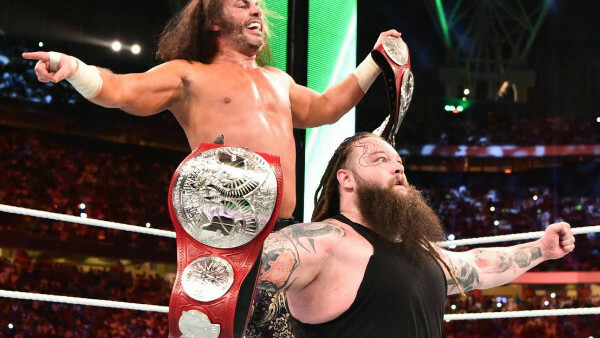 At WrestleMania 34, Wyatt helped Hardy win the fifth-annual Andre the Giant Memorial Battle Royal, officially forming an alliance with his former foe in the process. It didn't take long for them to find their footing as a tag team, because on the next night's Raw, they defeated Titus Worldwide in entertaining fashion. Their antics (including them yelling "Wonderful!" together, Hardy encouraging crowds to clap along with him, and even adopting their own tandem finisher) have made their matches a treat to watch. The dynamic duo winning the Raw Tag Team Championship at Greatest Royal Rumble late last month was merely a bonus. There's no telling what or who they'll aim to delete next.